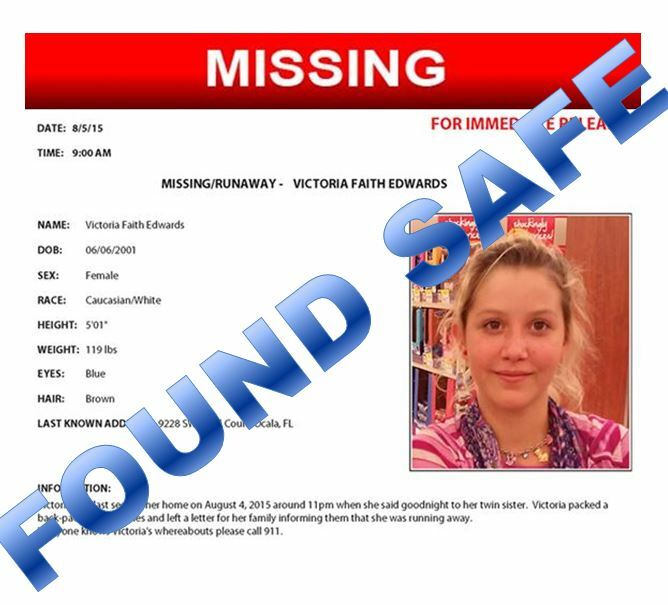 Ocala, Florida — Missing teen, Victoria Edwards, 14, who was last seen at her home on August 4, 2015, has been found. According to the Marion County Sheriff’s Office, Victoria was found safe in Tacoma, Washington on the evening of August 25. The suspect in the case, Michael Sonneman, 33, was arrested in Tacoma on Tuesday on one count of Interference with Child Custody. According to reports, Sonneman, who is known to the Edwards family, took Victoria from her parents’ home. The two parties met through mutual friends at a house warming party sometime between April and May 2015. The Special Investigations Bureau is in the early stages of this investigation. Updates will follow later today.